MommyBearMedia.com is a great website with family friendly movies! They only sell top-rated, high quality movies that are worth watching with a good message. And there is FREE 2-5 day shipping on ALL orders! You may ask why we are "Mommy Bear Media." Well, the owner is a mommy to 4 small cubs and her employees are her mom and two sisters. Also, we want to help protect you from all the negative movies and help you find some great movies that you may never have heard of or had forgotten about. We hope you enjoy your shopping experience! This site has great customer service..and they are FAST! You can keep in touch with Mommy Bear Media on Facebook and Twitter. 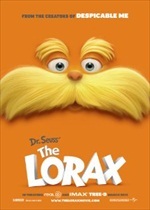 Mommy Bear Media would like to give a Tight Wad in Utah reader The Lorax DVD that will be released on August 7th! Already seen it? Right now Mommy Bear Media is offering a reviews promotion. You can write 5 reviews (at least 2 sentences long) and they will send you a $5 gift code for any purchase over $5! Go here to see all of their titles that are $6.96 or less! You can get Batman Begins for $.95 shipped!! One reader will win The Lorax (2012) DVD! a Rafflecopter giveaway Giveaway will end August 7th at 11:59 pm EST. Sponsored by Mommy Bear Media. I received a product for review. No other compensation was received. All opinions are my own. This promotion is in no way sponsored, endorsed or administered by, or associated with, Facebook. We hereby release Facebook of any liability. Winner(s) will be contacted by email and will have 48 hours after the giveaway ends to respond before another winner is picked. Thanks for the chance to win. My kids lovemthe Lorax. Great giveaway! I haven't seen the movie yet!!! 1 of my daughters was able to see this with a friend but my other 3 daughters have not and want to. Thanks for the chance to win. We saw this in theaters. It was SO cute. We would love to have this in our home. My daughters loved this movie! haven't seen it. Can't wait! THANK YOU for this give away! I would love to give this to one of my grandchildren for Christmas! I've been wanting to see this. It would be awesome to win it. I can't wait to see The Lorax! Fingers crossed. We haven't seen this one. My kids would love to win! I haven't seen this movie yet, but so want to! I haven't seen it yet but have heard really good things about it!! Haven't seen movie. Would love to see it and give it to granddaughter. my son's would love this plus they love getting things in the mail. DDs would love this DVD. I don't know who would love to win this more- my kiddos or me! We are huge fans of dr.seuss! I would love to watch this! I used to work at a movie theater but left RIGHT before this movie came out...never got to watch it! I haven't seen this one yet but would love to! My boys would love this. Thanks! We haven't seen The Lorax yet, but are looking forward to seeing it! My 3 kids would love to win this! Thanks for the review and giveaway! We havent seen The Lorax...but would love to. haven't seen this yet so would love to win! I haven't seen this yet. Thanks for the chance to win! My husband took my girls to this, and they all liked it. Thank you for the giveaway!!! Excited for the chance to win! My son loved the book! This is the perfect giveaway! Thank you for the opportunity! I have wanted to see this movie and would love to win the DVD! We are all looking forward to seeing this movie! Thanks for the post and thanks for being a great Premier Blogger for us. Always love a free movie! My kids would like this movie. I've loved the Lorax ever since I was little. I can't wait to see the new version! Love Dr. Seuss.. Can't wait to see the movie. Dr Seuss was so ahead of his time. He helped bring environmental issues to kids. I'd love for my daughter to see this movie! I haven't seen this movie, but I'm sure my kiddos would love it, thanks for the chance! Haven't seen it yet, but looks very entertaining. Thanks. i want to win this to watch with my nephew. I saw the movie and think it was great! I like the environmental awareness content. Took my boys to see this movie and loved it!. Would love to have it on dvd. Would love to win for my kids! We have not seen the movie yet so this would be great! Looks like a cute Movie! My family hasn't seen this yet but I know we would love it. Thanks for the chance! My daughter would love to see this movie. Would love to win this for my granddaughter Nellie. My daughter loved this movie and so did we, great one to add to the collection. My Grandson is all excited about this movie and I would love to have it for him to watch at my house. Would love to have this movie in my family library of dvds. GREAT movie!! would love to own this on dvd thanks for the chance to win! The Lorax is such a beautiful movie. I cried so hard at the movie theater. This would be a wonderful movie to have at home. Thanks for the give away! Thanks for the chance to win this movie!! i would like to win this for my family especially for my daughter this looks likes a fun movie to watch have never seen it only in commercials. I have not seen this movie but I seen the comericial and it looks so cute. We have not seen this movie yet, but I bet my kids and I would love it. We have been wanting to see this movie, but wasn't able to go to the theaters. My kids are so excited for this movie!! Since my kids didn't invite me to see this :( I'm still on the wait list for this movie... Count me in! Thanks for the giveaway! I can't believe we have not seen it yet. I've seen the movie but my kids haven't and I would love to win so they can watch it too! My daughter loves the book, but hasn't seen the movie yet - I'd love to win it for her! This is my kids favorite movie! They'd love this. I'm looking forward to seeing The Lorax. The Lorax was actually my son's very first movie theater film EVER! It took about 45 minutes for him to settle in, but he liked it a lot. I'd love to win the movie (but will be buying it anyway if I don't) so that we can watch it again at home. Thanks! My kids really want to see this! My kids want to see this! I enjoy the work of Theodor Geisel! my children and I haven't seen the Lorax yet, would love to win this. We saw this movie in the theater and LOVED it! Thanks for the giveaway! I have not seen this movie yet, but look forward to seeing it. My niece would love this! I haven't seen this movie yet but I really want to. We didn't get to see the Lorax in the theater but would love to own the dvd! I want to watch this! can't wait to win! Thank you!! We would love to see this!! I think my kids would enjoy this. would be over the moon to win this! My youngest saw this movie with her kindergarten teachers after school got out. I have yet to see it. We would love to have the chance to win this! Looks like a cute movie the grandchildren would love. Thanks! Me and the kids have not seen this one yet. We loved Horton Hears a Who with Jim Carey. If it is half as good as that one, we will love it! thanks for the giveaway i love getting your emails! My daughter liked this movie a lot. Thanks for the giveaway. Great giveaway, I can't wait to get this movie for our library.